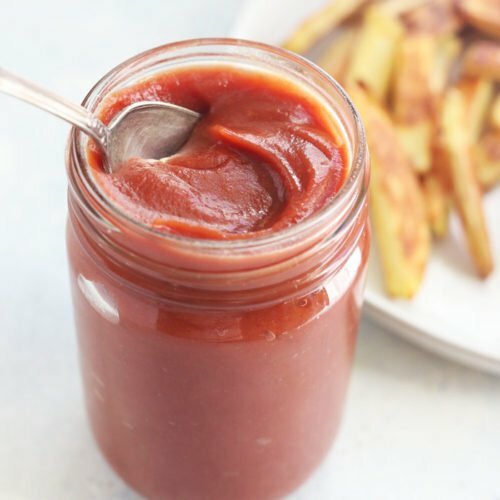 This HOMEMADE KETCHUP recipe is made in a blender in just 5 minutes! No need to simmer it on the stove, and it's made healthy without white sugar. Paleo & Vegan. Place the pitted dates in a bowl and pour the boiling water over them. Let the dates soak in the water as you add the other ingredients to the blender. In your blender add the tomato paste, vinegar, salt, onion powder, garlic powder, mustard, allspice, cloves, and 1/4 cup of water. Pour the dates and their soaking water in last, then blend until smooth. Stop and scrape down the blender, as needed to make sure everything is blended in. Pour the ketchup into an airtight container and store it in the fridge until ready to use. This should last at least 2 weeks in the fridge, if not longer, but I like to freeze at least half of it in a glass mason jar so that I can keep the rest frozen for up to 6 months.